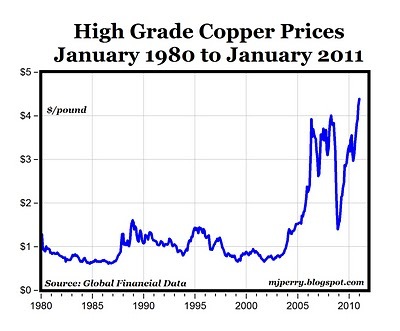 Copper prices have tripled since 2008, and thefts are skyrocketing as measured by news reports. Paul Kedrosky reported yesterday that copper thefts are rising again, due to the all-time record high prices in recent months. The chart above displays monthly copper prices back to 1980, and shows that copper prices have tripled from $1.40 per pound at the end of 2008 to recent highs this month approaching $4.50 per pound. According to a Google News search, there have been 545 news stories in just the last week containing the phrase “copper theft,” and that compares to 665 stories during the entire year of 2009 when copper prices were between $1.50-$3.00 per pound, and 1,750 stories last year as prices rose above $4 per pound by the end of the year. This entry was posted on Thursday, February 3rd, 2011 at 4:00 am and is filed under Front Office. You can follow any responses to this entry through the RSS 2.0 feed. You can leave a response, or trackback from your own site.